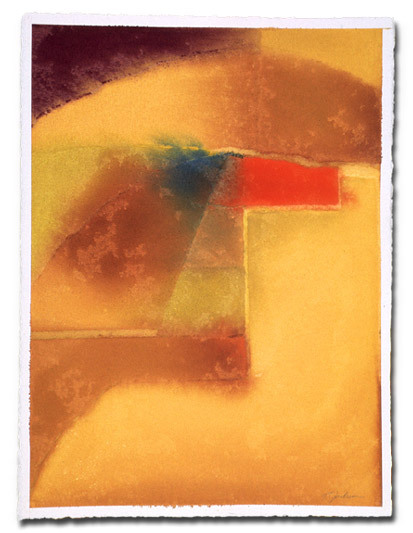 Stela 3, watercolor, 2002, 30" X 22"
This painting was exhibited in Iowa 2002: New Art at the Cedar Rapids Museum of Art, Cedar Rapids, IA, in 2002. The artists for this exhibition were selected by Jane Milosch, Curator at the Cedar Rapids Museum of Art and Daniel Schulman, Associate Curator of Modern and Contemporary Art at the Art Institute of Chicago. This painting was also exhibited in the International Juried Exhibition sponsored by the World Council for Arts & Culture & Peninsula Open Studios, Herbst International Exhibition Hall, the Presidio, San Francisco, CA, in 2003. This show was judged by Marian Parmenter, Director of the San Francisco Museum of Modern Art Artist’s Gallery.